It’s been an intense six months for our team. 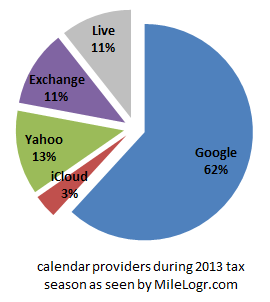 MileLogr is tied to the U.S. tax season (the three months ending in April 15) when 140 million taxpayers settle accounts with the tax man. This was our first season in the market after a three-month Beta period. If you’re not familiar with our product you might be asking what do mileage logs have to do with calendaring? Rather than fiddling around with odometer readings or GPS we offer users a novel, much easier approach to building a mileage log. If you use a digital calendar to record business meetings and errands (even occasionally) MileLogr will read your calendar for the entire past year and reconstruct a daily route of where you traveled. Of course there are lots of route variations and we have options to account for that. The best thing is that you don’t have to remember to turn on a GPS or record the fact that we just took a trip in a log or on your smartphone(most people simply forget or find the overhead overwhelming). The route is there for you to review without having done anything explicit to make that happen. Fun fact: the little sliver of iCloud users are actually our best paying customers! Percentage-wise, the highest percentage of users who buy the buy the product after trying it out are iCloud Calendar users followed by Google Calendar users. I speculate that users of iCloud are folks who are fully bought into the Apple mobile ecosystem and the products integrate so well that the resulting data that’s generated is more suitable to the scenario we’re optimized to solve.